This is not a tech blog (in the slightest) but this week I’ve ended up for one reason or another watching friends, colleagues and students operating computers. It was slow going. 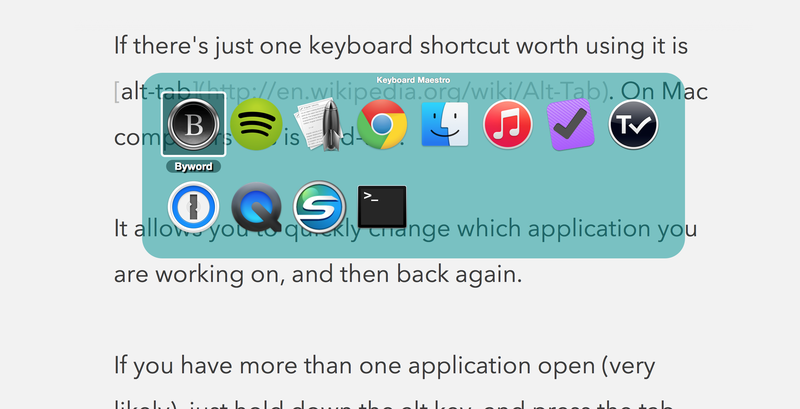 If there’s just one keyboard shortcut worth learning and using it is alt-tab. On Mac computers this is cmd-tab. It allows you to quickly change which application you are working on, and then back again. If you have more than one application open (very likely), just hold down the alt key, and press the tab key repeatedly until you select the application you want to switch to. Nowadays, it would seem that we are witnessing the strange death of the liberal university. Various commentators have noted how British universities, though still not-for-profit charities, are being hastily fashioned after private companies and the consequent narrowing of higher education’s raison d’être. The idea of the University as a place of civic education and critical enquiry has been put to a premature death by a raft of neo-capitalist political rationalities that promote inter alia divisive competition, false economies and philistine instrumentality. Academics are bound by ever multiplying forms of spurious measurement, misleading quantification and performance management. Students, in turn, are treated more like consumers than they are citizens, increasingly defrauded with a candyfloss world of university branding and marketing gimmickry. Grant capture, consultancy, citations, impact, quality assurance, unique selling points, student surveys and league tables, have become the new deities that all shall worship.